MAC Mineralize Skinfinish in Lightscapade: My all time favourite highlighter. Gives such a lovely glow to the skin, great to use on daily basic. I had it for over a year now and there is still a lot left. I mostly like it because it doesn't contain glitter. Benefit Watt's Up Highlighter: Another favourite highlighter of mine. I love to use this highlighter on nights out, as it's more shimmery than MAC Mineralize Skinfinish in Lightscapade. Sometimes the cream form annoys me, as it's slightly difficult to blend. Look Beauty Make Me Blush in Pinch: Great blusher to use on the days when I want more colour on my cheeks. I must say that Look Beauty Blusher are so well pigmented, I normally apply it lightly and then I slowly begin to build the colour up. Look Beauty Make Me Blush in Pinch is such a pretty shimmery baby pink, with slight blue undertones. Estee Lauder Blusher in True Sand: My all time favourite blush! The colour works so well with my skin tone and naturally pink cheeks. I love to wear it as there is no way you can apply too much on your cheeks, it will always look very "natural". I actually had discovered this blusher by accident, as I was getting colour matched for Estee Lauder Double Wear, the lovely MUA had applied it on my cheeks. 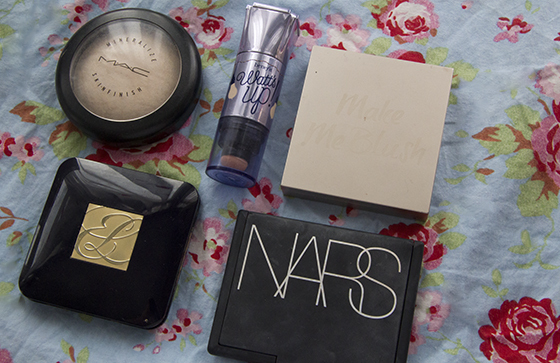 Nars Laguna Bronzer: The best bronzer ever! It doesn't contain any unnatural orange tone. Works so well with my pale skin. I love using it to contour my cheeks, although it does contains shimmer it doesn't really bother me. Ooo lovely choices! 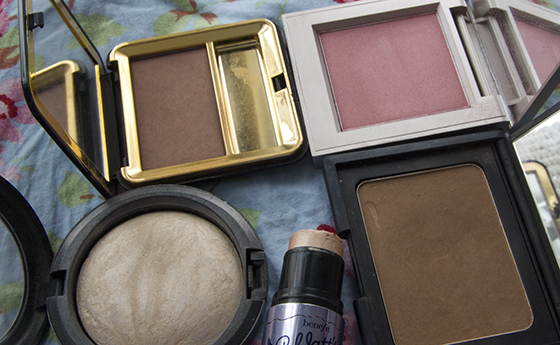 I really like the look of Lightscapade and the Estee Lauder blush.